The Parson was first recorded in 1851. Tag : Flat silver and purple floss. Tail : A topping, tippet fibres and two small blue chatter feathers, back to back. Body : Two turns of golden floss silk, remainder of golden yellow seal's fur merging into hot orange seal's fur. Hackle : Hot orange hackle over the seals fur. Throat : Six toppings, tied to curve downwards. Wing : Seven or eigth toppings, tied in to curve upwards. Cheeks : Medium size golden pheasant tippet feather on each side, about half as long as the wing. Head : Black ostrich herl and black silk. 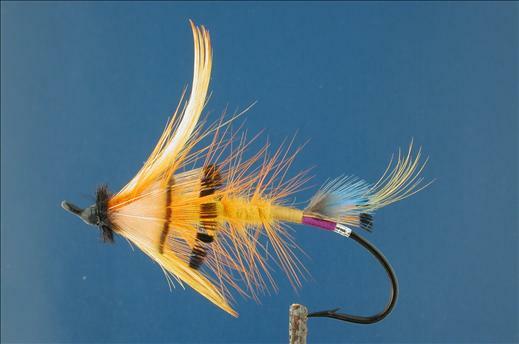 Currently there are no comments about the The Parson fly pattern from other fly fishermen yet.